During the Mardi Gras season each year, Rayne Memorial United Methodist Church, New Orleans, hosts members and guests for carnival festivities as a part of a fundraiser for the church youth program. Through ticket sales for access to restrooms, parking and food, the youth are able to earn enough to pay for their summer mission trip. Jazz Sunday is another tradition for Rayne Memorial, with one worship service held at 10 a.m. the Sunday immediately prior to Mardi Gras Day. 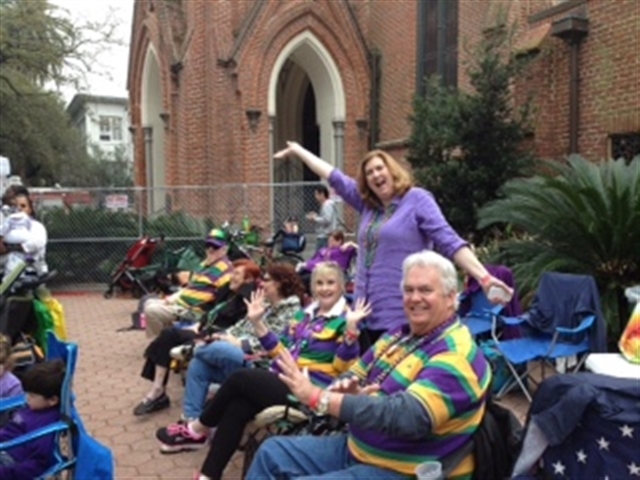 After the service, which features performances by the Mark Braud Band, worshippers are invited to stay and view the Sunday parades (and Bacchus in the evening!) which roll in front of the church. This year, more than 70 volunteers assisted with the fundraiser.